These three short stories are about a small American Eskimo dog named Bailey. She meets two new friends in her back yard, Gabby a chipmunk and Betsy a baby squirrel and the excitement begins. Each day they learn something new about each other. They are always on the look out for the nasty neighbor cat, which really brought them all together. Bailey invites her little friends into her house one day while Mom and Dad are at work. They were having so much fun in the house, until Mom and Dad come home early!! About the Author: LISA KIICK is the author of her first children's book "Bailey and Friends" - First Edition. She was inspired to write these short stories by her little dog, Bailey, an American Eskimo. There's lots of fun and imagination for Bailey and her new little friends, Gabby and Betsy. They have a new adventure each day. These short stories are to entertain and help young children understand the true meaning of friendship. Lisa grew up in the small town of Arendtsville, PA and now resides in Gettysburg with her husband Ed, and of course Bailey. She also has two grown stepsons, Troy and Barrett. 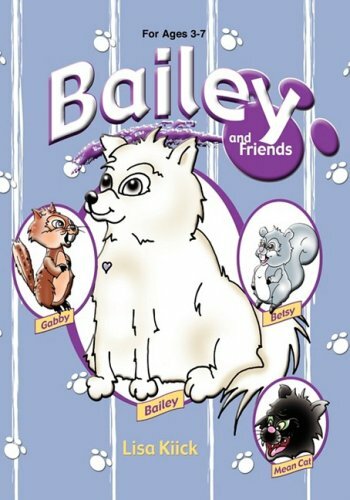 Lisa is now working on the Second Edition - "Bailey and Friends". About the Illustrator: RYAN STOUCH was born and raised in Gettysburg, PA. He currently resides there with his wife, Laurie, and his two sons, Jordan and Jesse. Ryan is a 1988 graduate of Antonelli Institute of Art and Photography. In 1990, Ryan started his own freelance graphic design business in the Gettysburg area. Ryan has worked with many area businesses and individuals in creating projects from logos, to civil war book covers, apparel graphics, and many designs for special events. "Over the years, I've had the opportunity to be part of many exciting projects. This one in particular has been something I've always wanted to be part of. It's been a great honor to have been asked to bring Bailey and her friends to life."